The pace of change is really speeding up. Have you noticed? Do you find yourself experiencing more and more days, weeks, and even years that seem to go by faster than ever? I do a lot of work in the Akashic Records and they refer to this time as The Quickening. The Quickening has come up in readings I’ve done for dozens of people this year. Change is the one constant in life. “The Quickening” is the ever-increasing pace of change. It is reflective of the rising consciousness of individual human beings, humanity as a whole, and indeed the entire planet Earth and all living things on it. The past week alone has seen huge shifts in social, political and economic issues here in the United States and around the world. 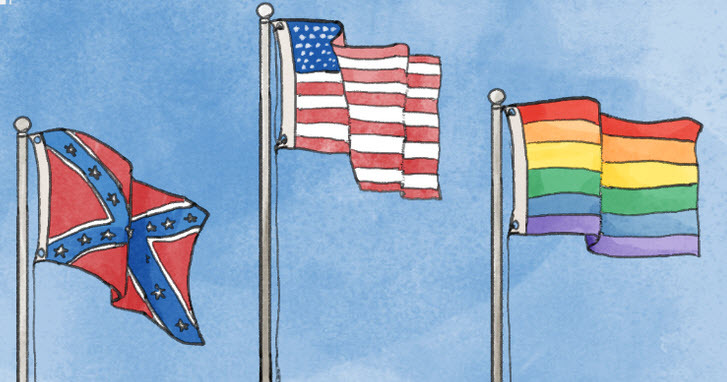 From Obamacare being once again confirmed as the law of the land, to the tipping point reached regarding the Confederate Battle Flag flying over the South Carolina state capital (and many more places), to the expansion of marriage rights to all citizens regardless of sexual preference. This is an amazing time to be alive. It is only going to get more so. This pace of change is only going to increase. A mere 3 years ago I was against gay marriage. I believed passing on all the legal rights of marriage via civil unions was enough. I thought marriage meant a man and a woman; End of story. I asked myself, why? The dictionary defined marriage as being between a man and a woman. Who am I to argue with the dictionary? That’s the way it’s always been. That isn’t enough of a reason. Doing things because that is the way they’ve always been would keep us living in caves, riding horses… “That’s the way it’s always been” kept slavery going, and women from voting. Marriage is a ceremony, a statement, a public action, a display of love… it is many things beyond legal rights. Love always and all ways. Love is equal. Heterosexuals have been screwing up marriage for generations. Is it really so sacred that homosexuals shouldn’t be allowed to be part of it. No. I quickly realized the answer, for me, was no. If your main argument for or against anything is “That’s the way it’s always been,” I invite you to open your heart and mind to more possibilities. Allow for a “What if?” thought or two. What if there was another way? A better way? Be willing to be wrong. The only constant in our lives is change. Institutions, systems, beliefs and structures that no longer serve us must and will change. Those who fight it, will lead a life of frustration, effort and disappointment. I know this first hand. When you resist change, you lose. When you can begin to embrace and welcome change, you are truly alive and in flow of All That Is. Note – I said “begin.” That doesn’t mean you’ll be thrilled by every change, but allow yourself to begin to embrace it. Open yourself to it. Allow the possibility that all change is meant to serve you in the long run. And so it is. For some interesting animated graphics on the change represented below, see This Is How Fast America Changes Its Mind. Leave a comment for: "The Pace of Change"